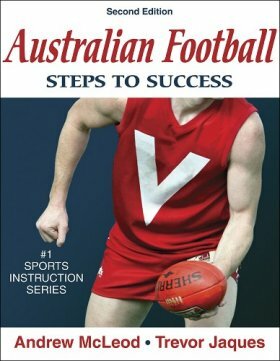 World Footy News was recently contacted to review a new publication called Australian Football - Steps to Success. The book is a joint effort between star Adelaide Crows player Andrew McLeod and long time club Training Services Manager Trevor Jaques. It details training methods and how to learn the skills of the game. This may be of particular interest to our many readers outside of Australia who are often new players to the sport and don't always have expert coaching readily available. The first edition was purely by Jaques whereas for the 2005 version he had the assistance of McLeod, a dual Norm Smith Medallist (for best on ground in AFL Grand Finals). The text is easy to read and simple diagrams explain basic skills. Overall the style is quite appropriate for beginners only starting to learn the unique skills of Aussie Rules, although more experienced players may still find some refinements - personally my screwie/torpedo punt has always spun well but not gained me much additional distance - according to this text I haven't quite been executing it correctly. In several places the reader is encouraged to take risks, pointing out that the very best players who turn games are prepared to do so. From the point of view of raising awareness of international Australian Football it is encouraging that the introduction "The Sport of Australian Football", in giving a brief history and current status of the game, mentions "Fledgling Australian football leagues also exist in the USA, Ireland, Canada, Denmark, Nauru, Papua New Guinea, Samoa, Japan and New Zealand". This of course omits several other relatively well-established countries, but with there likely to be many readers, this is another positive step in international footy being widely acknowledged. Modestly priced at around US$19.95 or AU$32.95, the text is a useful addition to the football skills genre. More details on the book can be found at Human Kinetics. Disclosure statement (in the interests of transparency): WFN was supplied with a copy of the product in exchange for reviewing it. There was no obligation as to the nature of the review.